High Foundation recently awarded a $50,000 grant to Lancaster Equity, a non-profit community development corporation whose mission is to increase access to housing and economic opportunity through intentional collaboration between nonprofit organizations and residents. This grant will support the construction of a park on the 300 Block of Beaver Street. 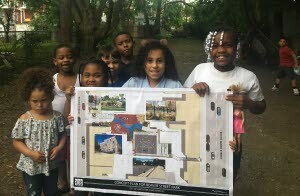 High Foundation has become the first major donor to this effort, taking the playground a step closer to becoming a reality. With these funds, Lancaster Equity will begin the construction process while continuing to raise funds from other sources. The organization intends to break ground on the project in late summer of 2019 and complete construction by late spring of 2020, utilizing the help of residents wherever possible. A concept design for the park has already been completed after a door-to-door canvassing effort and a series of meetings with residents. Plans include a half basketball court, age-appropriate playground equipment for toddlers and elementary schoolers, community gathering space, and public art installation. Each of these areas fulfills a need that the residents have identified: play, safety, learning, community-building, and beautification. Soon, this previously disengaged neighborhood will have accomplished its dream of building a safe place for kids to play and for its residents to connect with their neighbors.